The phrase “airport lounge” can mean very different things, depending on what country’s flag flies at the airport in question. 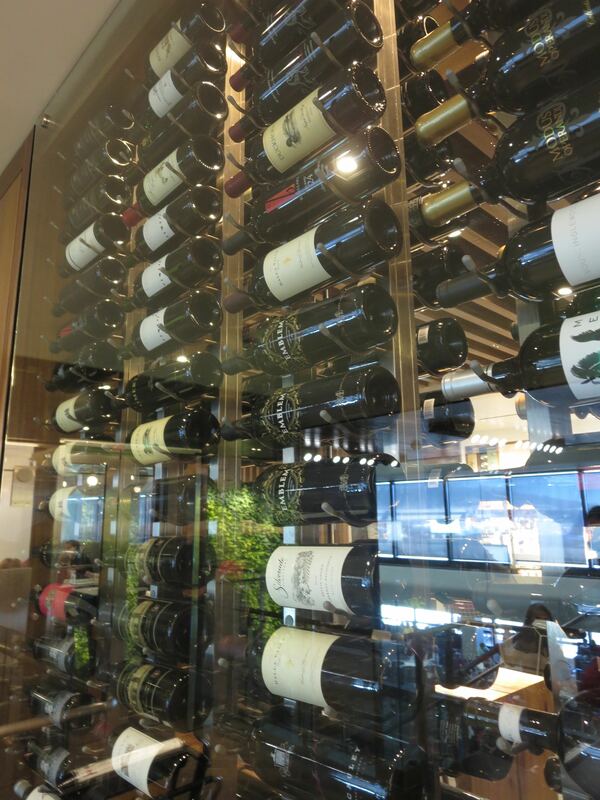 In Europe and Asia, many lounges are indulgent retreats with hot food and complimentary top-shelf wine, beer and booze. In the United States, they generally stop at free snacks and rail drinks — but anybody can buy a membership, instead of that privilege being reserved for premium-cabin and exceptionally frequent flyers. American Express’s small network of Centurion Lounges (Las Vegas, Dallas-Fort Worth, LaGuardia and San Francisco, with Miami coming this spring) aim to bridge that gap. They offer the cuisine and cocktails of a lounge you might find at Heathrow or Frankfurt at roughly the price of an American Airlines Admirals Club, Delta Sky Club, or United Club membership — with an Amex Platinum card included. That $450/year card provides free Centurion Lounge access to you and two guests or your immediate family. Between that and such other benefits as reimbursement for $200 in airline fees, Amex essentially invites you to switch your travel loyalty from an airline to its card. Other Amex card members pay $50 a visit to the lounge, while Visa, MasterCard and cash won’t get you in at all. Based on a visit to the Centurion Lounge in LAS in September 2014 (I paid) and in SFO three months later (I was a guest of Amex), I can highly endorse using that privilege if you have a qualifying card and even paying the $50 if you have two-plus hours free in an airport. But should the Centurion Lounges coax you to get a Plat card? That depends on geography more than finance. All four Centurion Lounges are on the small side, with LAS and DFW’s measuring 9,000 square feet, SFO at 8,200 and LGA at 5,000. The two I’ve visited felt smaller than that, courtesy of each one being cut into smaller spaces for dining, sipping, working or snoozing. The upside of that is not feeling lost in a horde of delayed travelers. The downside is that you may wind up sitting far from the buffet or bar. The DFW, LAS and SFO spots also offer a family room for kids to let off some energy, play Nintendo Wii or watch child-compatible TV. On my December visit with my wife and daughter, our 4-year-old was soon happily bouncing around. Those three lounges also offer showers—although at SFO, there’s only one available, so you may not get a chance to try it. DFW adds a small spa. Each Centurion Lounge has its own menus, with a name-brand chef behind the food offerings. At SFO, for instance, Christopher Kostow (The Restaurant at Meadowood, St. Helena, Calif.) got credit for our lunch selections but cut his ties with the lounge in February; he’s since been replaced by Cédric Vongerichten (Perry St. in New York City). My lunch at SFO was fantastic: meltingly tender pork shoulder with apples and vinegar, a side of pumpkin gently cooked in goat’s milk butter and chestnut pudding with roast chocolate. But that menu went months without revision after the lounge opened in November. Amex publicist Kimberly Litt said the menu will change “seasonally,” which is far less often than I’ve seen the food offerings rotate at Lufthansa’s excellent lounge at Dulles International Airport. The beer, wine and cocktails skew local, which at SFO meant the San Francisco breweries Anchor Steam, Speakeasy and 21st Amendment on tap and 10 Napa wines available for tasting via a wall-mounted system across from the bar. A local distillery or two show up on the cocktail menu, and even the mixers reveal thoughtful choices: The ginger ale at SFO was the mixologist favorite, Fever Tree. Note that when I asked for a glass of apple juice for our daughter, it came in an actual breakable glass. The bartender admitted that plastic cups might be a good item to add. Power outlets abound and USB ports to charge phones and tablets are plentiful too. There’s no lack of bandwidth: Speedtest.net rated the SFO lounge Wi-Fi’s downloads at 38.22 million bits per second and its uploads at 42.74 Mbps. If you don’t have your own computer, the lounges offer their own desktops (at SFO, two iMacs tucked away in a corner, with an HP printer/scanner combo). Conference rooms are available at LAS and DFW but not SFO or LGA. The Centurion Lounge can’t match an airline lounge in being able to untangle your travel if delays or cancellations start to crumple your itinerary. The agents can, however, book restaurants and entertainment and address any issues you may have with your Amex account. At SFO, I asked whether my no-longer-issued, no-annual-fee, cash-back Amex would get an EMV-chip upgrade anytime soon. The agent said she’d have a chip-and-signature replacement sent to my house; it landed there three business days later. The Centurion Lounge as it exists now makes every other domestic airline lounge look weak, even after such upgrades as United’s in-progress rollout of more substantial food. But unless you bounce between only Centurion-graced airports — make that, particular terminals with Centurion Lounges, which at SFO rules out two of the three domestic ones — you’ll either be spending your time at those other, far more numerous lounges, spending your money at bars or restaurants or expending your patience waiting at the gate. And while Amex, as Litt put it, wants to “have a presence” in airports most frequented by card members, that presence may vary. In the Seattle-Tacoma International Airport, the company will soon open a smaller Centurion Studio, offering beverages and snacks, but not a “a full hot buffet,” she said. If Amex manages to expand this network to most of my usual airports, I’d be sorely tempted to get a Platinum card. For now, the $50/day-pass rate represents a tempting way to spend the $20 and $30 rebates I keep getting kicked back by Amex’s promotional offers.